Diatoms are one of the most common types of phytoplankton. Phytoplankton /ˌfaɪtoʊˈplæŋktən/ are the autotrophic (self-feeding) components of the plankton community and a key part of oceans, seas and freshwater basin ecosystems. The name comes from the Greek words φυτόν (phyton), meaning "plant", and πλαγκτός (planktos), meaning "wanderer" or "drifter". Most phytoplankton are too small to be individually seen with the unaided eye. However, when present in high enough numbers, some varieties may be noticeable as colored patches on the water surface due to the presence of chlorophyll within their cells and accessory pigments (such as phycobiliproteins or xanthophylls) in some species. Phytoplankton come in many shapes and sizes. Phytoplankton are the foundation of the oceanic food chain. When two currents collide (here the Oyashio and Kuroshio currents) they create eddies. Phytoplankton concentrates along the boundaries of the eddies, tracing the motion of the water. 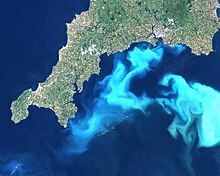 Algal bloom off south England. Phytoplankton are photosynthesizing microscopic biotic organisms that inhabit the upper sunlit layer of almost all oceans and bodies of fresh water on Earth. They are agents for "primary production", the creation of organic compounds from carbon dioxide dissolved in the water, a process that sustains the aquatic food web. Phytoplankton obtain energy through the process of photosynthesis and must therefore live in the well-lit surface layer (termed the euphotic zone) of an ocean, sea, lake, or other body of water. Phytoplankton account for about half of all photosynthetic activity on Earth. Their cumulative energy fixation in carbon compounds (primary production) is the basis for the vast majority of oceanic and also many freshwater food webs (chemosynthesis is a notable exception). While almost all phytoplankton species are obligate photoautotrophs, there are some that are mixotrophic and other, non-pigmented species that are actually heterotrophic (the latter are often viewed as zooplankton). Of these, the best known are dinoflagellate genera such as Noctiluca and Dinophysis, that obtain organic carbon by ingesting other organisms or detrital material. Phytoplankton are crucially dependent on minerals. These are primarily macronutrients such as nitrate, phosphate or silicic acid, whose availability is governed by the balance between the so-called biological pump and upwelling of deep, nutrient-rich waters. Phytoplankton nutrient composition drives and is driven by the Redfield ratio of macronutrients generally available throughout the surface oceans. 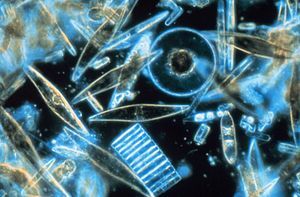 However, across large regions of the World Ocean such as the Southern Ocean, phytoplankton are also limited by the lack of the micronutrient iron. This has led to some scientists advocating iron fertilization as a means to counteract the accumulation of human-produced carbon dioxide (CO2) in the atmosphere. Large-scale experiments have added iron (usually as salts such as iron sulphate) to the oceans to promote phytoplankton growth and draw atmospheric CO2 into the ocean. However, controversy about manipulating the ecosystem and the efficiency of iron fertilization has slowed such experiments. Phytoplankton depend on Vitamin B for survival. Areas in the ocean have been identified as having a major lack of Vitamin B, and correspondingly, phytoplankton. The effects of anthropogenic warming on the global population of phytoplankton is an area of active research. Changes in the vertical stratification of the water column, the rate of temperature-dependent biological reactions, and the atmospheric supply of nutrients are expected to have important effects on future phytoplankton productivity. The effects of anthropogenic ocean acidification on phytoplankton growth and community structure has also received considerable attention. Phytoplankton such as coccolithophores contain calcium carbonate cell walls that are sensitive to ocean acidification. Because of their short generation times, evidence suggests some phytoplankton can adapt to changes in pH induced by increased carbon dioxide on rapid time-scales (months to years). Phytoplankton serve as the base of the aquatic food web, providing an essential ecological function for all aquatic life. Under future conditions of anthropogenic warming and ocean acidification, changes in phytoplankton mortality may be significant. [further explanation needed] One remarkable Of the many food chains in the ocean – remarkable due to the small number of links – is that of phytoplankton sustaining krill (a crustacean similar to a tiny shrimp), which in turn sustain baleen whales. The term phytoplankton encompasses all photoautotrophic microorganisms in aquatic food webs. However, unlike terrestrial communities, where most autotrophs are plants, phytoplankton are a diverse group, incorporating protistan eukaryotes and both eubacterial and archaebacterial prokaryotes. There are about 5,000 known species of marine phytoplankton. How such diversity evolved despite scarce resources (restricting niche differentiation) is unclear. In terms of numbers, the most important groups of phytoplankton include the diatoms, cyanobacteria and dinoflagellates, although many other groups of algae are represented. One group, the coccolithophorids, is responsible (in part) for the release of significant amounts of dimethyl sulfide (DMS) into the atmosphere. DMS is oxidized to form sulfate which, in areas where ambient aerosol particle concentrations are low, can contribute to the population of cloud condensation nuclei, mostly leading to increased cloud cover and cloud albedo according to the so-called CLAW Hypothesis. Different types of phytoplankton support different trophic levels within varying ecosystems. In oligotrophic oceanic regions such as the Sargasso Sea or the South Pacific Gyre, phytoplankton is dominated by the small sized cells, called picoplankton and nanoplankton (also referred to as picoflagellates and nanoflagellates), mostly composed of cyanobacteria (Prochlorococcus, Synechococcus) and picoeucaryotes such as Micromonas. Within more productive ecosystems, dominated by upwelling or high terrestrial inputs, larger dinoflagellates are the more dominant phytoplankton and reflect a larger portion of the biomass. In the early twentieth century, Alfred C. Redfield found the similarity of the phytoplankton’s elemental composition to the major dissolved nutrients in the deep ocean. Redfield proposed that the ratio of carbon to nitrogen to phosphorus (106:16:1) in the ocean was controlled by the phytoplankton’s requirements, as phytoplankton subsequently release nitrogen and phosphorus as they are remineralized. This so-called “Redfield ratio” in describing stoichiometry of phytoplankton and seawater has become a fundamental principle to understand marine ecology, biogeochemistry and phytoplankton evolution. However, the Redfield ratio is not a universal value and it may diverge due to the changes in exogenous nutrient delivery and microbial metabolisms in the ocean, such as nitrogen fixation, denitrification and anammox. The dynamic stoichiometry shown in unicellular algae reflects their capability to store nutrients in an internal pool, shift between enzymes with various nutrient requirements and alter osmolyte composition. Different cellular components have their own unique stoichiometry characteristics, for instance, resource (light or nutrients) acquisition machinery such as proteins and chlorophyll contain a high concentration of nitrogen but low in phosphorus. Meanwhile, growth machinery such as ribosomal RNA contains high nitrogen and phosphorus concentrations. Based on allocation of resources, phytoplankton is classified into three different growth strategies, namely survivalist, bloomer and generalist. Survivalist phytoplankton has a high ratio of N:P (>30) and contains an abundance of resource-acquisition machinery to sustain growth under scarce resources. Bloomer phytoplankton has a low N:P ratio (<10), contains a high proportion of growth machinery, and is adapted to exponential growth. Generalist phytoplankton has similar N:P to the Redfield ratio and contain relatively equal resource-acquisition and growth machinery. A 2010 study published in Nature reported that marine phytoplankton had declined substantially in the world's oceans over the past century. Phytoplankton concentrations in surface waters were estimated to have decreased by about 40% since 1950, at a rate of around 1% per year, possibly in response to ocean warming. The study generated debate among scientists and led to several communications and criticisms, also published in Nature. In a 2014 follow-up study, the authors used a larger database of measurements and revised their analysis methods to account for several of the published criticisms, but ultimately reached similar conclusions to the original Nature study. These studies and the need to understand the phytoplankon in the ocean led to the creation of the Secchi Disk Citizen Science study in 2013. The Secchi Disk study is a global study of phytoplankton conducted by seafarers (sailors, anglers, divers) involving a Secchi Disk and a smartphone app. Estimates of oceanic phytoplankton change are highly variable. One global ocean primary productivity study found a net increase in phytoplankton, as judged from measured chlorophyll, when comparing observations in 1998–2002 to those conducted during a prior mission in 1979–1986. Chlorophyll are photosynthetic pigments that are often used as an indicator of phytoplankton biomass. However, using the same database of measurements, other studies concluded that both chlorophyll and primary production had declined over this same time interval. The airborne fraction of CO2 from human emissions, the percentage neither sequestered by photosynthetic life on land and sea nor absorbed in the oceans abiotically, has been almost constant over the past century, and that suggests a moderate upper limit on how much a component of the carbon cycle as large as phytoplankton have declined. In the northeast Atlantic, where a relatively long chlorophyll data series is available, and the site of the Continuous Plankton Recorder (CPR) survey, a net increase was found from 1948 to 2002. During 1998–2005, global ocean net primary productivity rose in 1998, followed by a decline during the rest of that period, yielding a small net increase. Using six climate model simulations, a large multi-university study of ocean ecosystems predicted "a global increase in primary production of 0.7% at the low end to 8.1% at the high end," by 2050 although with "very large regional differences" including "a contraction of the highly productive marginal sea ice biome by 42% in the Northern Hemisphere and 17% in the Southern Hemisphere." A more recent multi-model study estimated that primary production would decline by 2-20% by 2100 A.D. Despite substantial variation in both the magnitude and spatial pattern of change, the majority of published studies predict that phytoplankton biomass and/or primary production will decline over the next century. 3OH) in the ocean in quantities that could rival or exceed that which is produced on land. Phytoplankton are a key food item in both aquaculture and mariculture. Both utilize phytoplankton as food for the animals being farmed. In mariculture, the phytoplankton is naturally occurring and is introduced into enclosures with the normal circulation of seawater. In aquaculture, phytoplankton must be obtained and introduced directly. The plankton can either be collected from a body of water or cultured, though the former method is seldom used. Phytoplankton is used as a foodstock for the production of rotifers, which are in turn used to feed other organisms. Phytoplankton is also used to feed many varieties of aquacultured molluscs, including pearl oysters and giant clams. A 2018 study estimated the nutritional value of natural phytoplankton in terms of carbohydrate, protein and lipid across the world ocean using ocean-colour data from satellites, and found the calorific value of phytoplankton to vary considerably across different oceanic regions and between different time of the year. The production of phytoplankton under artificial conditions is itself a form of aquaculture. Phytoplankton is cultured for a variety of purposes, including foodstock for other aquacultured organisms, a nutritional supplement for captive invertebrates in aquaria. Culture sizes range from small-scale laboratory cultures of less than 1L to several tens of thousands of liters for commercial aquaculture. Regardless of the size of the culture, certain conditions must be provided for efficient growth of plankton. The majority of cultured plankton is marine, and seawater of a specific gravity of 1.010 to 1.026 may be used as a culture medium. This water must be sterilized, usually by either high temperatures in an autoclave or by exposure to ultraviolet radiation, to prevent biological contamination of the culture. Various fertilizers are added to the culture medium to facilitate the growth of plankton. A culture must be aerated or agitated in some way to keep plankton suspended, as well as to provide dissolved carbon dioxide for photosynthesis. In addition to constant aeration, most cultures are manually mixed or stirred on a regular basis. Light must be provided for the growth of phytoplankton. The colour temperature of illumination should be approximately 6,500 K, but values from 4,000 K to upwards of 20,000 K have been used successfully. The duration of light exposure should be approximately 16 hours daily; this is the most efficient artificial day length. 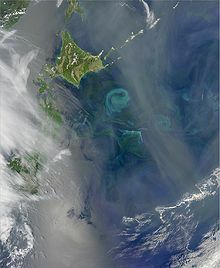 Wikimedia Commons has media related to Phytoplankton. Wikimedia Commons has media related to Algal blooms. ^ Michael J. Behrenfeld; et al. (30 March 2001). "Biospheric primary production during an ENSO transition". Science. 291 (5513): 2594–7. doi:10.1126/science.1055071. PMID 11283369. Retrieved 3 August 2017. ^ "NASA Satellite Detects Red Glow to Map Global Ocean Plant Health" NASA, 28 May 2009. ^ "Satellite Sees Ocean Plants Increase, Coasts Greening". NASA. 2 March 2005. Retrieved 9 June 2014. ^ "How much do oceans add to world's oxygen?". Earth & Sky. 8 June 2015. Retrieved 4 April 2016. ^ "Phytoplankton levels dropping (NASA)". Youtube. ^ a b Roach, John (7 June 2004). "Source of Half Earth's Oxygen Gets Little Credit". National Geographic News. Retrieved 4 April 2016. ^ Tappan, Helen (April 1968). "Primary production, isotopes, extinctions and the atmosphere". Palaeogeography, Palaeoclimatology, Palaeoecology. 4 (3): 187–210. Bibcode:1968PPP.....4..187T. doi:10.1016/0031-0182(68)90047-3. Retrieved 4 April 2016. ^ Richtel, M. (1 May 2007). "Recruiting Plankton to Fight Global Warming". New York Times. ^ Monastersky, Richard (1995). "Iron versus the Greenhouse: Oceanographers Cautiously Explore a Global Warming Therapy". Science News. 148 (14): 220–1. doi:10.2307/4018225. JSTOR 4018225. ^ Wall, Tim (10 May 2017). "Vitamin Deserts Limit Marine Life". Discovery News. ^ a b Henson, S. A.; Sarmiento, J. L.; Dunne, J. P.; Bopp, L.; Lima, I.; Doney, S. C.; John, J.; Beaulieu, C. (2010). "Detection of anthropogenic climate change in satellite records of ocean chlorophyll and productivity". Biogeosciences. 7 (2): 621–40. doi:10.5194/bg-7-621-2010. ^ a b Steinacher, M.; Joos, F.; Frölicher, T. L.; Bopp, L.; Cadule, P.; Cocco, V.; Doney, S. C.; Gehlen, M.; Lindsay, K.; Moore, J. K.; Schneider, B.; Segschneider, J. (2010). "Projected 21st century decrease in marine productivity: a multi-model analysis". Biogeosciences. 7 (3): 979–1005. doi:10.5194/bg-7-979-2010. ^ Collins, Sinéad; Rost, Björn; Rynearson, Tatiana A. (25 November 2013). "Evolutionary potential of marine phytoplankton under ocean acidification". Evolutionary Applications. 7 (1): 140–155. doi:10.1111/eva.12120. ISSN 1752-4571. PMC 3894903. PMID 24454553. ^ Lohbeck, Kai T.; Riebesell, Ulf; Reusch, Thorsten B. H. (8 April 2012). "Adaptive evolution of a key phytoplankton species to ocean acidification". Nature Geoscience. 5 (5): 346–351. doi:10.1038/ngeo1441. ISSN 1752-0894. ^ Hallegraeff, G.M. (2003). "Harmful algal blooms: a global overview" (PDF). In Hallegraeff, Gustaaf M.; Anderson, Donald Mark; Cembella, Allan D.; Enevoldsen, Henrik O. (eds.). Manual on Harmful Marine Microalgae. Unesco. pp. 25–49. ISBN 978-92-3-103871-6. ^ Hutchinson, G. E. (1961). "The Paradox of the Plankton". The American Naturalist. 95 (882): 137–45. doi:10.1086/282171. ^ Charlson, Robert J.; Lovelock, James E.; Andreae, Meinrat O.; Warren, Stephen G. (1987). "Oceanic phytoplankton, atmospheric sulphur, cloud albedo and climate". Nature. 326 (6114): 655–61. Bibcode:1987Natur.326..655C. doi:10.1038/326655a0. ^ Quinn, P. K.; Bates, T. S. (2011). "The case against climate regulation via oceanic phytoplankton sulphur emissions". Nature. 480 (7375): 51–6. Bibcode:2011Natur.480...51Q. doi:10.1038/nature10580. PMID 22129724. ^ Calbet, A. (2008). "The trophic roles of microzooplankton in marine systems". ICES Journal of Marine Science. 65 (3): 325–31. doi:10.1093/icesjms/fsn013. ^ Redfield, Alfred C. (1934). "On the Proportions of Organic Derivatives in Sea Water and their Relation to the Composition of Plankton". In Johnstone, James; Daniel, Richard Jellicoe (eds.). James Johnstone Memorial Volume. Liverpool: University Press of Liverpool. pp. 176–92. OCLC 13993674. ^ a b Arrigo, Kevin R. (2005). "Marine microorganisms and global nutrient cycles". Nature. 437 (7057): 349–55. Bibcode:2005Natur.437..349A. doi:10.1038/nature04159. PMID 16163345. ^ Fanning, Kent A. (1989). "Influence of atmospheric pollution on nutrient limitation in the ocean". Nature. 339 (6224): 460–63. Bibcode:1989Natur.339..460F. doi:10.1038/339460a0. ^ Klausmeier, Christopher A.; Litchman, Elena; Levin, Simon A. (2004). "Phytoplankton growth and stoichiometry under multiple nutrient limitation". Limnology and Oceanography. 49 (4 Part 2): 1463–70. Bibcode:2004LimOc..49.1463K. doi:10.4319/lo.2004.49.4_part_2.1463. ^ Klausmeier, Christopher A.; Litchman, Elena; Daufresne, Tanguy; Levin, Simon A. (2004). "Optimal nitrogen-to-phosphorus stoichiometry of phytoplankton". Nature. 429 (6988): 171–4. Bibcode:2004Natur.429..171K. doi:10.1038/nature02454. PMID 15141209. ^ Boyce, Daniel G.; Lewis, Marlon R.; Worm, Boris (2010). "Global phytoplankton decline over the past century". Nature. 466 (7306): 591–6. Bibcode:2010Natur.466..591B. doi:10.1038/nature09268. PMID 20671703. ^ Schiermeier, Quirin (2010). "Ocean greenery under warming stress". Nature. doi:10.1038/news.2010.379. ^ Mackas, David L. (2011). "Does blending of chlorophyll data bias temporal trend?". Nature. 472 (7342): E4–5, discussion E8–9. Bibcode:2011Natur.472E...4M. doi:10.1038/nature09951. PMID 21490623. ^ a b Rykaczewski, Ryan R.; Dunne, John P. (2011). "A measured look at ocean chlorophyll trends". Nature. 472 (7342): E5–6, discussion E8–9. Bibcode:2011Natur.472E...5R. doi:10.1038/nature09952. PMID 21490624. ^ McQuatters-Gollop, Abigail; Reid, Philip C.; Edwards, Martin; Burkill, Peter H.; Castellani, Claudia; Batten, Sonia; Gieskes, Winfried; Beare, Doug; Bidigare, Robert R.; Head, Erica; Johnson, Rod; Kahru, Mati; Koslow, J. Anthony; Pena, Angelica (2011). "Is there a decline in marine phytoplankton?". Nature. 472 (7342): E6–7, discussion E8–9. Bibcode:2011Natur.472E...6M. doi:10.1038/nature09950. PMID 21490625. ^ Boyce, Daniel G.; Dowd, Michael; Lewis, Marlon R.; Worm, Boris (2014). "Estimating global chlorophyll changes over the past century". Progress in Oceanography. 122: 163–73. Bibcode:2014PrOce.122..163B. doi:10.1016/j.pocean.2014.01.004. ^ Antoine, David (2005). "Bridging ocean color observations of the 1980s and 2000s in search of long-term trends". Journal of Geophysical Research. 110 (C6): C06009. Bibcode:2005JGRC..110.6009A. doi:10.1029/2004JC002620. ^ Gregg, Watson W.; Conkright, Margarita E.; Ginoux, Paul; O'Reilly, John E.; Casey, Nancy W. (2003). "Ocean primary production and climate: Global decadal changes". Geophysical Research Letters. 30 (15): 1809. Bibcode:2003GeoRL..30.1809G. doi:10.1029/2003GL016889. ^ Gregg, Watson W.; Conkright, Margarita E. (2002). "Decadal changes in global ocean chlorophyll". Geophysical Research Letters. 29 (15): 20–1–20–4. Bibcode:2002GeoRL..29.1730G. doi:10.1029/2002GL014689. ^ Knorr, Wolfgang (2009). "Is the airborne fraction of anthropogenic CO2emissions increasing?". Geophysical Research Letters. 36 (21): L21710. Bibcode:2009GeoRL..3621710K. doi:10.1029/2009GL040613. ^ Raitsos, Dionysios E. (2005). "Extending the SeaWiFS chlorophyll data set back 50 years in the northeast Atlantic". Geophysical Research Letters. 32 (6): L06603. Bibcode:2005GeoRL..32.6603R. doi:10.1029/2005GL022484. ^ Behrenfeld, Michael J.; O’Malley, Robert T.; Siegel, David A.; McClain, Charles R.; Sarmiento, Jorge L.; Feldman, Gene C.; Milligan, Allen J.; Falkowski, Paul G.; Letelier, Ricardo M.; Boss, Emmanuel S. (2006). "Climate-driven trends in contemporary ocean productivity". Nature. 444 (7120): 752–5. Bibcode:2006Natur.444..752B. doi:10.1038/nature05317. PMID 17151666. ^ Sarmiento, J. L.; Slater, R.; Barber, R.; Bopp, L.; Doney, S. C.; Hirst, A. C.; Kleypas, J.; Matear, R.; Mikolajewicz, U.; Monfray, P.; Soldatov, V.; Spall, S. A.; Stouffer, R. (2004). "Response of ocean ecosystems to climate warming". Global Biogeochemical Cycles. 18 (3): n/a. Bibcode:2004GBioC..18.3003S. doi:10.1029/2003GB002134. ^ Hofmann, M; Worm, B; Rahmstorf, S; Schellnhuber, H J (2011). "Declining ocean chlorophyll under unabated anthropogenic CO2emissions". Environmental Research Letters. 6 (3): 034035. Bibcode:2011ERL.....6c4035H. doi:10.1088/1748-9326/6/3/034035. ^ Boyd, Philip W.; Doney, Scott C. (2002). "Modelling regional responses by marine pelagic ecosystems to global climate change". Geophysical Research Letters. 29 (16): 53–1–53–4. Bibcode:2002GeoRL..29.1806B. doi:10.1029/2001GL014130. ^ Beaulieu, C.; Henson, S. A.; Sarmiento, Jorge L.; Dunne, J. P.; Doney, S. C.; Rykaczewski, R. R.; Bopp, L. (2013). "Factors challenging our ability to detect long-term trends in ocean chlorophyll". Biogeosciences. 10 (4): 2711–24. Bibcode:2013BGeo...10.2711B. doi:10.5194/bg-10-2711-2013. ^ Mace, Georgina M.; Mora, Camilo; Wei, Chih-Lin; Rollo, Audrey; Amaro, Teresa; Baco, Amy R.; Billett, David; Bopp, Laurent; Chen, Qi; Collier, Mark; Danovaro, Roberto; Gooday, Andrew J.; Grupe, Benjamin M.; Halloran, Paul R.; Ingels, Jeroen; Jones, Daniel O. B.; Levin, Lisa A.; Nakano, Hideyuki; Norling, Karl; Ramirez-Llodra, Eva; Rex, Michael; Ruhl, Henry A.; Smith, Craig R.; Sweetman, Andrew K.; Thurber, Andrew R.; Tjiputra, Jerry F.; Usseglio, Paolo; Watling, Les; Wu, Tongwen; Yasuhara, Moriaki (2013). "Biotic and Human Vulnerability to Projected Changes in Ocean Biogeochemistry over the 21st Century". PLoS Biology. 11 (10): e1001682. doi:10.1371/journal.pbio.1001682. PMC 3797030. PMID 24143135. ^ Taucher, J.; Oschlies, A. (2011). "Can we predict the direction of marine primary production change under global warming?" (PDF). Geophysical Research Letters. 38 (2): n/a. Bibcode:2011GeoRL..38.2603T. doi:10.1029/2010GL045934. ^ Bopp, Laurent; Monfray, Patrick; Aumont, Olivier; Dufresne, Jean-Louis; Le Treut, Hervé; Madec, Gurvan; Terray, Laurent; Orr, James C. (2001). "Potential impact of climate change on marine export production". Global Biogeochemical Cycles. 15 (1): 81–99. Bibcode:2001GBioC..15...81B. doi:10.1029/1999GB001256. ^ Cermeno, P.; Dutkiewicz, S.; Harris, R. P.; Follows, M.; Schofield, O.; Falkowski, P. G. (2008). "The role of nutricline depth in regulating the ocean carbon cycle". Proceedings of the National Academy of Sciences. 105 (51): 20344–9. Bibcode:2008PNAS..10520344C. doi:10.1073/pnas.0811302106. JSTOR 25465827. PMC 2603260. PMID 19075222. ^ Cox, Peter M.; Betts, Richard A.; Jones, Chris D.; Spall, Steven A.; Totterdell, Ian J. (2000). "Acceleration of global warming due to carbon-cycle feedbacks in a coupled climate model". Nature. 408 (6809): 184–7. doi:10.1038/35041539. PMID 11089968. ^ "Major Source of Methanol in the Ocean Identified". Woods Hole Oceanographic Institution. 10 March 2016. Retrieved 30 March 2016. ^ Mincer, Tracy J.; Aicher, Athena C. (2016). "Methanol Production by a Broad Phylogenetic Array of Marine Phytoplankton". PLOS One. 11 (3): e0150820. Bibcode:2016PLoSO..1150820M. doi:10.1371/journal.pone.0150820. PMC 4786210. PMID 26963515. ^ a b Roy, Shovonlal (12 February 2018). "Distributions of phytoplankton carbohydrate, protein and lipid in the world oceans from satellite ocean colour". The ISME Journal. 12 (6): 1457–1472. doi:10.1038/s41396-018-0054-8. ISSN 1751-7370. PMC 5955997. PMID 29434313. ^ "Nutrition study reveals instability in world's most important fishing regions". Greeson, Phillip E. (1982). An annotated key to the identification of commonly occurring and dominant genera of Algae observed in the Phytoplankton of the United States. Washington, D.C.: United States Government Printing Office. ISBN 978-0-607-68844-3. Kirby, Richard R. (2010). Ocean Drifters: A Secret World Beneath the Waves. Studio Cactus. ISBN 978-1-904239-10-9. Martin, Ronald; Quigg, Antonietta (2013). "Tiny Plants That Once Ruled the Seas". Scientific American. 308 (6): 40–5. Bibcode:2013SciAm.308f..40M. doi:10.1038/scientificamerican0613-40. PMID 23729069. This page was last edited on 11 April 2019, at 05:43 (UTC).